भेड़िया Pack. 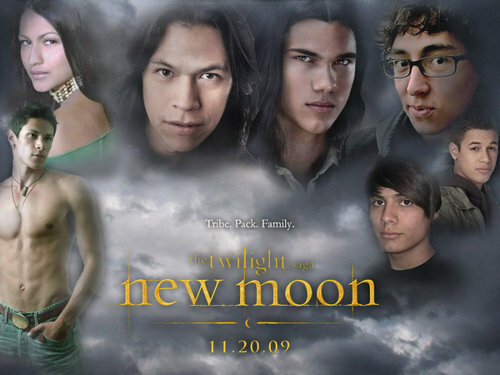 Picture of all the offical वेयरवोल्फ in the pack for the New Moon movie.. HD Wallpaper and background images in the जेकब ब्लैक club tagged: new moon wolf pack movie cast. This जेकब ब्लैक wallpaper might contain गर्म टब, हॉट टब, चित्र, headshot, closeup, हेडशॉट, and क्लोज़अप. From left to right (cirle): Paul, Emily, Sam, Jacob, Quil, Jared, and Embry. This is a good looking pack!!! The guy who plays Paul is ADORABLE!!! Hold up--when was Leah casted???????????????????? She must of meant Emily, not Leah. Yeah, that's what I meant, sorry. but i only belong to jacob.